Andrew C-W owns a June 1998 Scorpio 24V saloon in Moondust Silver. He was in touch with us throughout most of 2003 about an engine idle problem. As the story unfolded over the months that followed and his Cosworth saloon languished in the back of a main dealer workshop, Andrew never gave up his determination to have his 24V running right - no matter how long it took or how many experts were needed to look at it. The story begins in January 2003, when the Cosworth saloon was taken off the road with a timing chain rattle that had become progressively worse until it now rattled at idle when hot. It languished in the first Ford Main Dealer (FMD1) for two months awaiting new timing chains! However, during March the work was carried out. 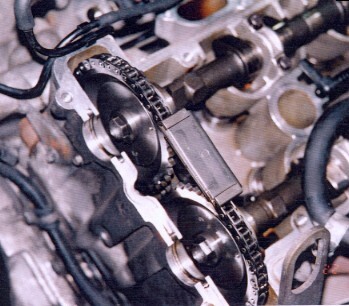 Both timing chains were replaced, together with the four camshaft sprockets and lockwashers, the crankshaft sprockets, the rail guides, thrust washers and gaskets. The crankshaft pulley was corroded in situ (and broke the puller too) and also had to be replaced. The cost of this work came out at about £2,000. You could carry out this work yourself. Andrew was upset to discover that, although the timing chain rattle had indeed been cured, engine idle was now very poor - the engine 'hunted' against the handbrake when stationary, and idle was now fluttering and erratic. were all replaced - and to no avail, except to increase the bill: idle quality was unchanged. 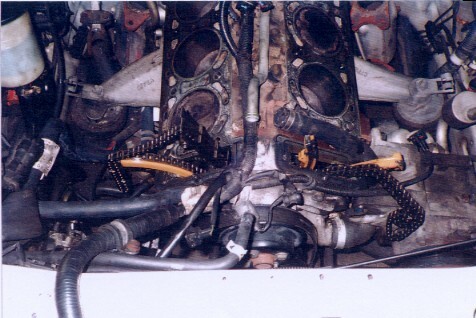 Alarmingly, FMD1 now suggested that particles from the catalyst might have been drawn into the engine through the EGR pipe, and that they should dismantle the engine and rebuild it - or that there was a fault with the EECV Powertrain Control Module. During this period I met with Andrew for a Vehicle Explorer scan on the car and confirmed that there were no DTCs and there was no visible reason for the poor idle - no trace of an air leak. By now Andrew had become frustrated by the poor communication he had with the FMD1 and had lost faith in their ability to put the problem right. He asked if I knew of another good Main Dealer and I suggested Inchcape Ford where another owner (thank you Peter) had strongly recommended Steve Waterlow, the master technician there. Andrew took the vehicle back and delivered it to Inchcape Ford. 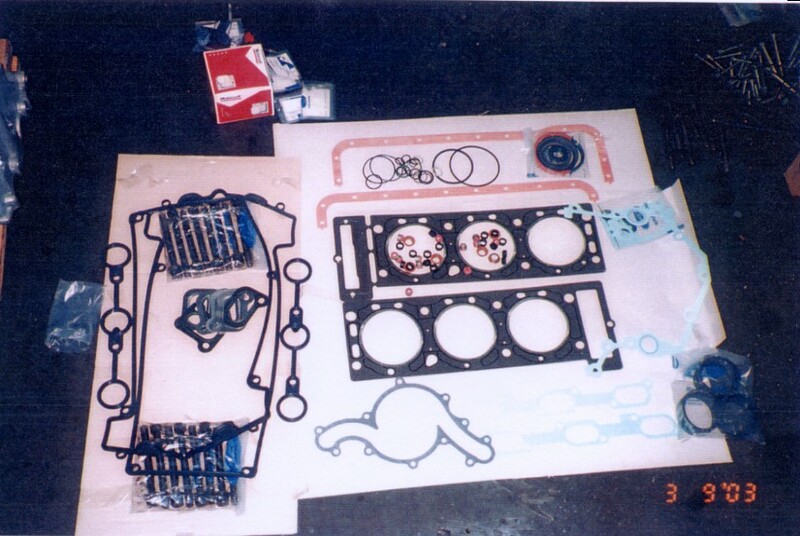 Engine Overhaul Gasket set for the 24V Cosworth - at £330 (+VAT) a time. 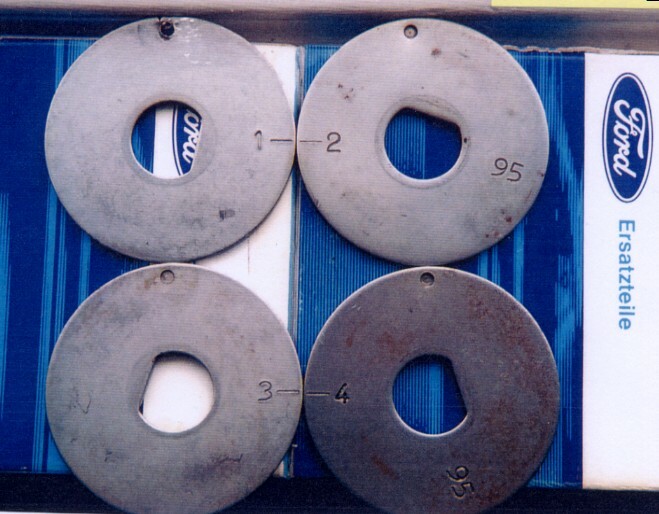 This is a cost to consider before lifting off cylinder heads. Initially, Steve made a very thorough inspection of the engine and inlet system, which was completely removed and rebuilt together with WDS diagnosis. A test was carried out on the engine vacuum and it was found that the reading was an erratic 16 to 20 inches of mercury, where it was expected to be about 20 inches. The EGR pressure sensor was giving a high reading and was replaced. Compression tests showed 175psi, but unexpectedly slow to get to pressure. The Lamda sensors were datalogged using WDS, and HO2S11 (Bank 1 pre-catalyst) sensor showed insufficient switching. A gas check showed excessive hydrocarbons in the exhaust (330ppm at idle) and the Bank 1 catalyst was removed, examined but passed fit. The wiring looms through the engine bay were all opened carefully, checked visually, and an oscilloscope confirmed no problems with the wiring. Ignition Kv checks were carried out and found to be uneven, so all of the spark plugs were replaced (again) together with one of the plug leads. Andrew received the car back with engine idle in the same condition . A this point it was thought that there might be a base engine fault or possibly a problem with the injectors since the car had been stood up for months at FMD1. Andrew tried some Injector Cleaner while Cosworth Technology was consulted about the idle problem. 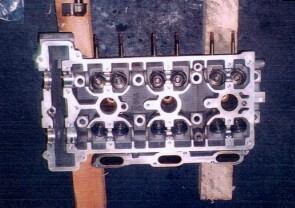 Cosworth made the point that reassembly of the camshafts required a high degree of care. 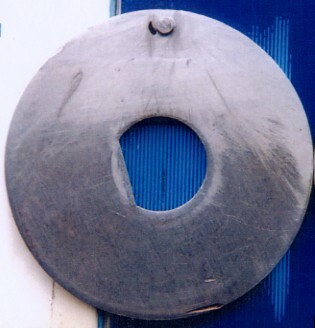 It was feared that, even though the punch marks might have lined up with the top of the cylinder head the sprocket might still not have been fitted or clamped up properly. The Injector Cleaner had had no effect. Andrew booked the car into Inchcape Ford for the second round of investigation. He had been impressed by Steve's skill and attention to detail, and had been kept fully consulted about progress throughout. They noted Cosworth's advice, but had in mind the considerable cost of removing the cam shafts again and needed to eliminate any other cause before going down that road. Cylinder heads off, an expensive operation at Main Dealer prices. Cams detail. This is Bank 2 - 3 & 4 sprockets are dished. The timing marks can just be seen on the lockwashers. Steve got to grips with the engine again. Once again he stripped down the inlet system and cam covers for a further series of tests. Compression checks showed (cylinders 1 to 6 ) 180, 190, 190, 190,185, 190 and cylinder leakage tests were revealed as 5%, 8%, 8%, 7%, 4% and 7%. WDS datalogger data showed that the Idle Air Control Valve duty cycle was too high (too open) and a base setting could not be made. Steve examined the throttle housing and found that the butterfly was open one or two millimeters due to the throttle stop being wound up. This was a factory setting and should not have been disturbed by FMD1. The butterflies were refitted and idle adjusted. There was a continuous discussion between Steve Waterlow and the Ford Technical department. Tests were completed on the EGR, all the valves were leak-tested but no conclusions were reached. Having exhausted all of the Ford Technical Services options, the Ford Field Engineer was called out and attended in due course. Andrew met with the Ford Field Engineer and was a party to the discussions. They bore in mind the considerable cost of stripping out the cylinder heads, (the gasket set alone for the 24V is £330) but recognised that they were running out of options. The Field Engineer plumped for removing the Bank 1 cylinder head. Andrew and Steve agreed that both should come off and be checked thoroughly for any internal damage. Steve used an endoscope to examine the combustion cylinders and the valves. Both the cylinder heads were then stripped out and slightly poor valve seatings were found only on No 1 cylinder, but nevertheless all of the 24 valves seatings were recut and ground in. The cylinder heads were reinstalled and the engine run again. Result? No difference. Poor vacuum readings and idle remained unacceptable. A lesser technician might be forgiven for giving up at this point, but Steve was determined that the poor idling problem would not defeat him. The engine had not done this before the timing chain replacement at FMD1, therefore it should not do it now. Ignition, compression, cylinder heads, valve sealing and inlet system had all been checked and eliminated as a cause. The Fueling and Catalysts functions had been checked and some replaced. He persevered with his own suspicion about the valve timing - Andrew agreed to leave the Scorpio with him and Steve would work on it in downtime. While Ford Technical was of the view that a tiny difference in the punch mark on the cam would not matter, Steve felt that a small discrepancy in cam timing could be the cause of the poor idle. He stripped out the right hand inlet and valve cover and checked the timing mark on the No1 camshaft. This was slightly off-line by about 2mm above the cylinder head face. Steve made up his own bracket for a dial gauge to find out manually what the valve timings were by turning the engine on the crank pulley and noting the movement of his dial gauge. He found that the exhaust valves were closing at 33° ATDC instead of 14°. This was clearly incorrect but not adjustable. The exhaust valves were closing late, which doubled the total valve overlap time from 22 degrees to 44 degrees. The lockwashers in question. Only two have the correct '95' marking. Steve's amended lockwasher. The original punch mark is just visible to the left of the new mark. Only mm made a huge difference. Steve experimented with lockwasher 1. He ground off the existing lug, marked where he thought the punch should be and welded a new punch on the lockwasher, filing it to fit the hole in the cam insert. Steve rebuilt the engine again and ran it. The engine immediately showed a vast improvement in running and engine vacuum. The effect of the extended exhaust valve overlap was that engine pumping efficiency was reduced, as well as dumping unburnt fuel into the exhaust manifold, which was then detected by the HO2S sensor and the FUEL system switched to Lean. Taken together this produced the stumbling idle and a hunting in Drive. Light was now dawning. 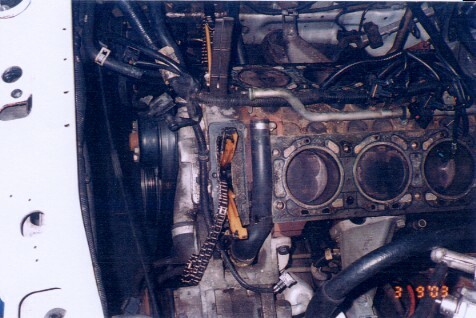 The Lockwashers installed by FMD1 as part of the timing chain replacement had included two washers for the Granada 24V (BOA) engine which had different valve timings. Although they looked identical the correct plates for the Scorpio 24V have '95' stamped on them and once this was realised it was clear that lockwashers 1 and 3 were incorrect. Steve sent away for a complete new Lockwasher set and once they'd arrived installed them and rebuilt the engine. Eureka! Perfect idle and smooth power right up to the red line. A simple error by a parts picker at the Ford depot had caused many, many of hours of labour, months of worry and the complete top end rebuild of the Cosworth. Once the dust had settled, Ford agreed to pay for 60% of the total cost (about £2000) of the rectification work at Inchcape Ford because they accepted that the incorrect lockwashers had been supplied by their Central Parts Division in Daventry. While Andrew did appreciate this, it did not compensate him for the nine months of delay, frustration and inconvenience that resulted from such a simple error. A less determined owner may simply have scrapped the car, and all credit to Andrew for sticking with it to the end. Steve, justifiably called a Master Technician, had solved a problem that had defeated Ford Technical and the Field Engineer. He had achieved this by going back to first principles, engineering his own indicator device to check the valve timing and then worked a solution which proved his theory. Neither was this the first time he had proved his worth - Peter S reported some time ago that his Scorpio poor running problem had been sorted by Steve, who had found a loom problem and repaired it economically. This same problem has completely defeated other Main Dealers . So what exactly is a Lockwasher? To the right is the Ford Catalogue image. You can see that the camshaft sprockets (23 and 24) have a round hole in the centre. They are not 'keyed' to the camshafts in any way and can spin freely about the camshaft axis. and yes, that is the right way round. The Granada lockwashers are Finis 6 642 028 for No 1 to 6642031 for No 4. If you lose the Inserts (29) they are Finis 6 642 038, and these are carried over from the Granada. Any alterations in valve timing made during production requires a change only to the lockwasher, instead of expensive re-tooling for the camshafts and/or the sprockets. In the event that a timing chain snaps, the punched lug on the lockwasher will shear and allow the sprocket to turn without smashing every valve into the pistons. At least, that's the theory. The moral of this story is that if you decide to change the lockwashers during a cam or timing chain change - check to make sure that there is '95' stamped on every one. Andrew noticed a hidden coolant pipe which may cause concern for the future. It runs from the centre V of the cylinder heads behind the front timing chain chest of Bank 2 and in front of the cylinder head, which is set rearward compared with Bank 1, and drops down to the nearside of the engine, where it leads to the radiator through the thermostat. In the exact centre of this pix the coolant hose can be seen, nestling between the front timing chest and No 4 cylinder, Bank 2. Andrew doubts that this coolant pipe could be changed without removing the cylinder head, so while it was off he had the pipe renewed. On the right, a pix illustrating this. The pipe can be seen in the exact centre of Andrew's photo. 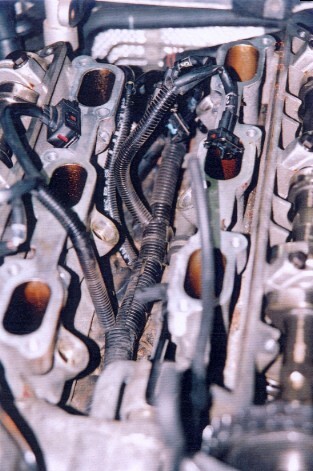 It attaches to the coolant housing which connects the two cylinder heads in the V. The metal coolant pipe above it is the supply for the heater. 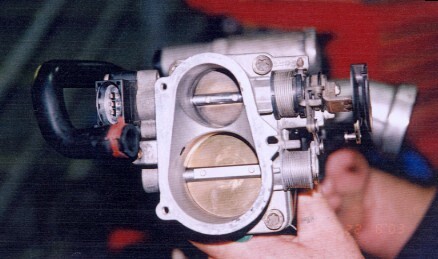 To its left the timing chest is open and the plastic chain guides can be seen. Obviously if you think about it, the two banks of pistons cannot be in line with each other - there must be a stagger to enable space on the single crankshaft to line up with a piston. 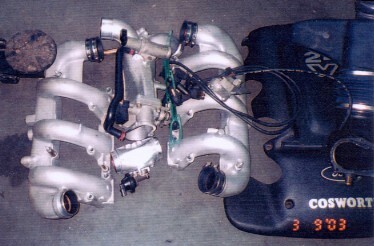 Here, Cosworth has utilised the space to greatly increase the coolant flow through the heads. If Bank 2 cylinder head is ever off, or even if the Inlet system has been removed, check the condition of this bypass pipe very carefully and consider changing it while you're in there - Finis 7 334 646. Thanks to Andrew C-W for the detail and the excellent pictures.